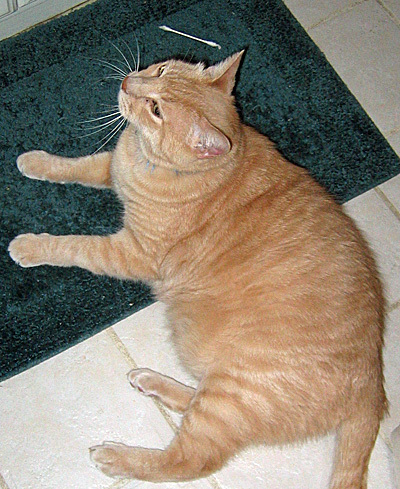 Jeff found a stray Q-tip that had wandered under the bathroom vanity. After considering it briefly, he decided to kill it. Staff disposed of the body before Jeff could eat it, as cotton swabs can carry parasites. Glad to see that Jeff is able to keep up his Kill Training whilst indoors. Staff could collect some live bugs and small mammals and bring them inside to appease the murderous needs of Jeff. Thank you for all the recent posts as well as your Q & A. Good to see Jeff’s teeth are as sharp and white as ever. His tartar must be under control. It looks like El Jefe is brushing his teeth in that third photo! 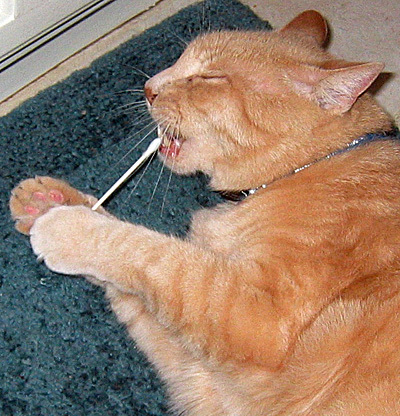 That poor Q-tip never stood a chance, despite its attempt at playing dead. Maghe sure you fine’ an’ deespose’ ob the bardy yourselb, Jefe, Staff are nebber to be trosted. They weell throw eet een the nearest trashccan. You cannard trost Qteeps, hombre..fine’ eed, fine’ eed before tragedy strighes! Good job, Jeff! He even managed to swab his teeths at the same time! Multi-tasking is something that comes naturally to a cat. I like your site. 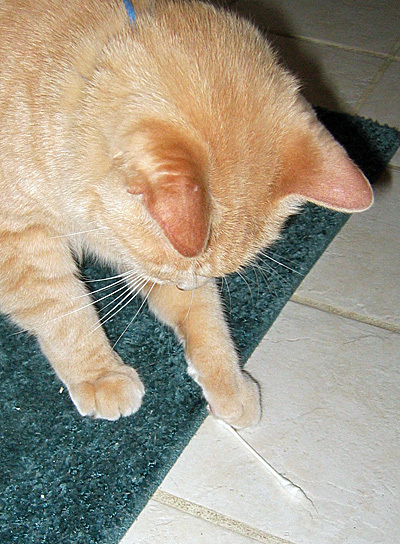 I can appreciate a cat that is good at what cats are supposed to do – efficient predation of pest species. I have a similar situation developing at my house. There is a large orange cat that occassionally appears in our yard. I took pics of him hunting a mole that has been ravaging our yard. I am fervently rooting for him to catch the infernal creature. I’m going to setup a night vision camera soon to get a better idea of his comings and goings, most of which are probably nocturnal. Should be interesting to see what he’s up to. I second Angela–thanks for the insight!